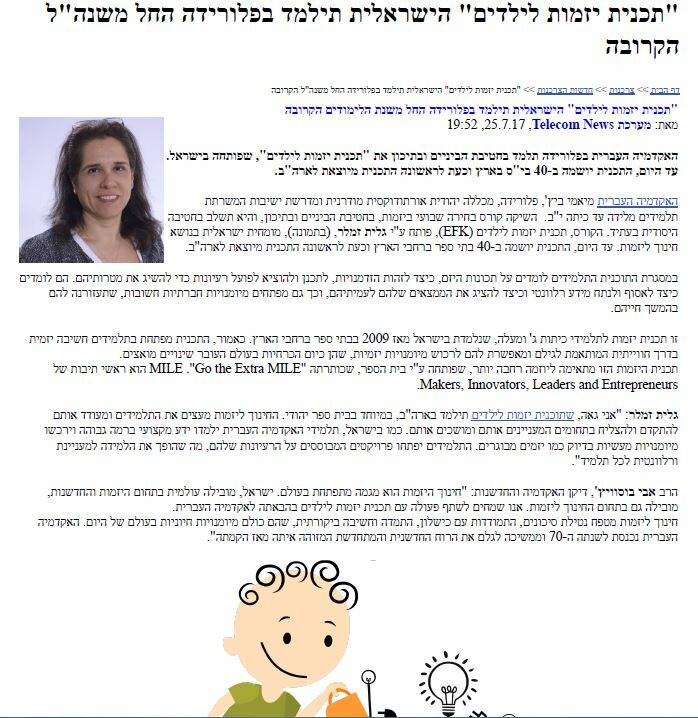 On this page, we have collected articles that have been written about the Israeli Entrepreneurship for Kids Program headed by Galit Zamler. 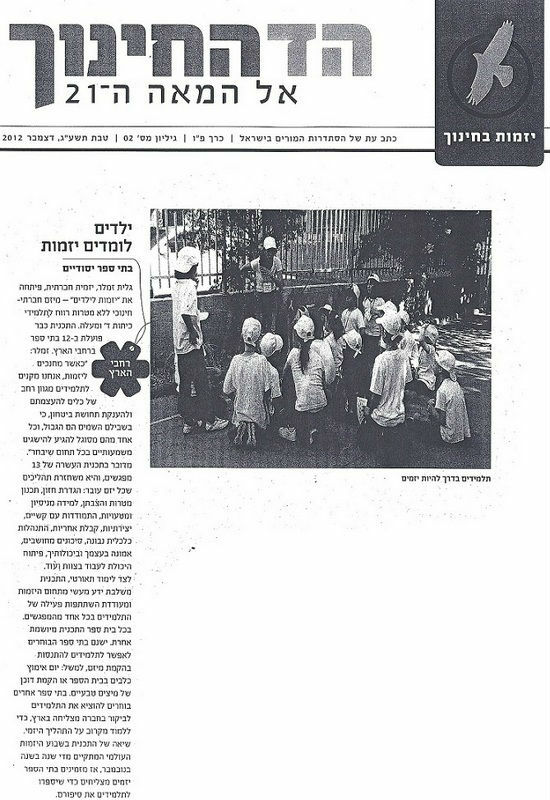 Sometimes the articles are about the schools that taught the program, and about initiatives that children implemented and sometimes they are about Galit's activities and lectures. 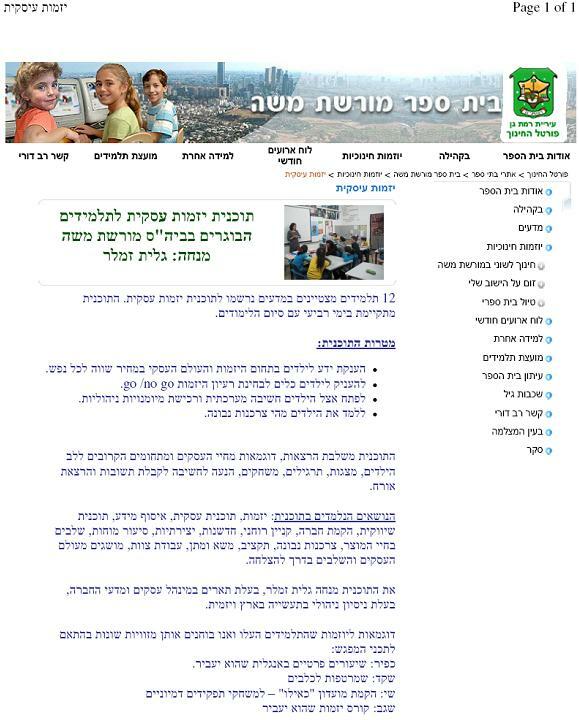 The Jewish Internet Magazine in Canada Jewish Independent wrote how the EFK program began as a volunteer project and how it has evolved and spread to many Israeli schools and abroad. At the beginning of January 2019, the EFK program was launched in India by Carengrow company during an innovation and entrepreneurship event in cooperation with Mr. Winny Patro from the Ministry of Education in Andhra Pradesh and led by Dr. Meghana. 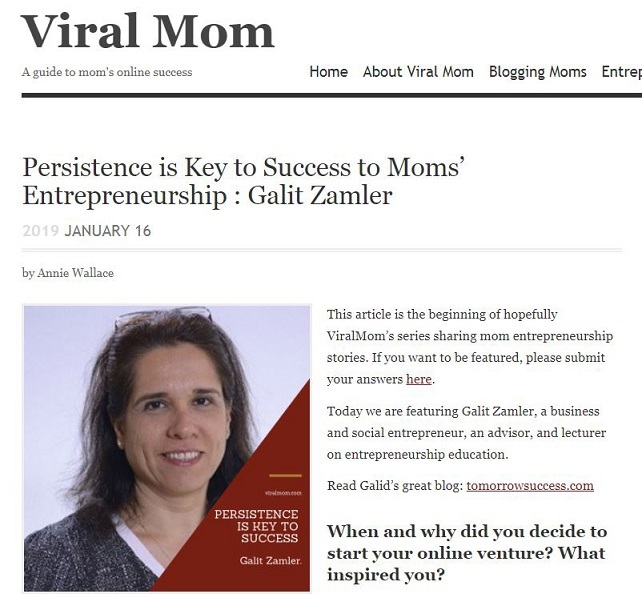 Internet magazine Viral Mom interviewed Galit Zamler as an entrepreneur and asked her to give one tip, which in her opinion is the most important to success. Abigail Klein Leichman, a writer and associate editor at ISRAEL21c wrote about Galit Zamler and her entrepreneurial program. 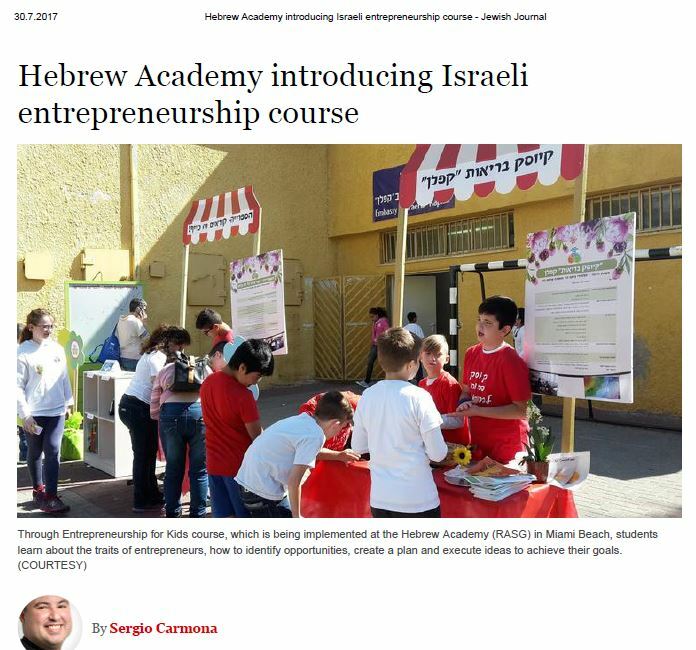 Entrepreneurship for Kids Program was launched for the first time outside of Israel at the Hebrew Academy school, Miami Beach, Florida, USA, headed by Rabbi Avi Bossewitch, Dean of Academics and Innovation. The Sun Sentinel magazine interviewed Galit Zamler and Rabbi Avi Bossewitch on the occasion of the launch. To read the full interview, click on the link. 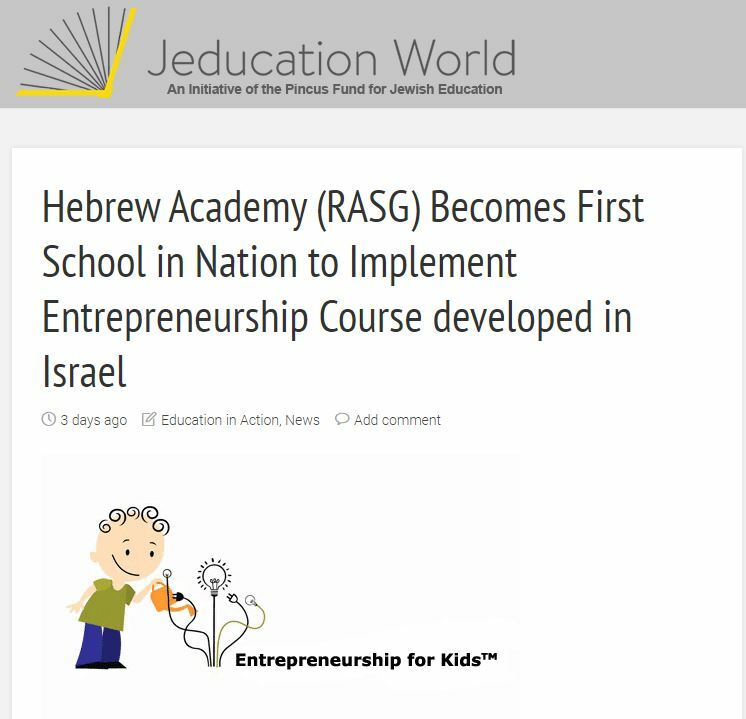 The Jeducation World magazine also published an article on the implementation of the Entrepreneurship for Kids Program for the first time in the USA. Click the link for the full article. Telecom News Magazine also wrote about launching the Entrepreneurship for Kids Program in the USA. Sixth-graders at the "Katznelson" elementary school studying entrepreneurial lessons with the teacher Lee Glick. The students thought about ideas for projects and prepared models, which they presented on a special day to Galit Zamler, the developer of the Entrepreneurship for Kids Program. Gil Shurka, an entrepreneurial columnist for The Marker, wrote about the entrepreneurial program for kids. 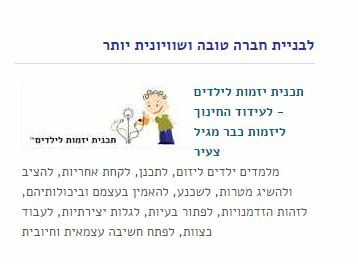 Click to read the full article about the Entrepreneurial Education in Schools (in Hebrew). Avi Weiss, the main editor of the website Telecom News, attended a lecture by Galit Zamler as part of the entrepreneurship club of the Open University. In his article "our oil wells are the minds of the entrepreneurs. Therefore, starting an entrepreneurship in elementary school", summed up the main content of the lecture. I am 10 website helps students to learn and practice the material that is taught in schools for free by using videos on various learning topics, and so with the kind assistance of volunteers. The site found it necessary to specify our entrepreneurial programme for children as one that helps to build a better and more equal company - and for that, the we thank to those behind the website "I am 10." 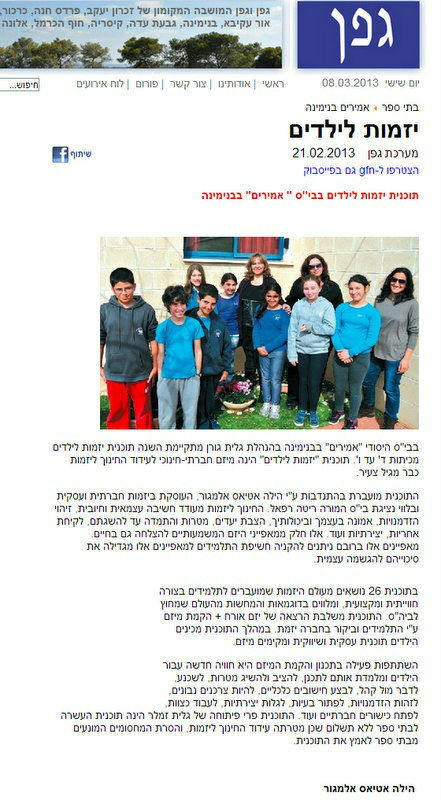 Tamira Galili, a magazine reporter for "free lesson", visited the "HaShalom" school in Mevasseret Zion, which has implemented the enrichment program for the second year, guided by Sigal Bar, the Vice Principal. After the visit, this article appeared: "learning to make dreams come true" in the magazine. 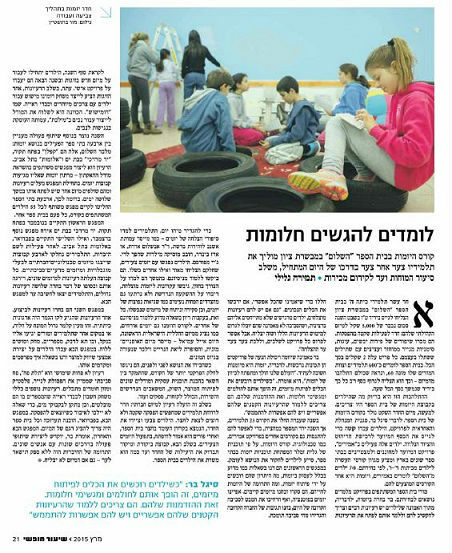 The article tells about the "Students' Room" initiated by the young entrepreneurs, the Tu Bishvat Fair project and the first Hackathon in Israel for the young entrepreneur students. 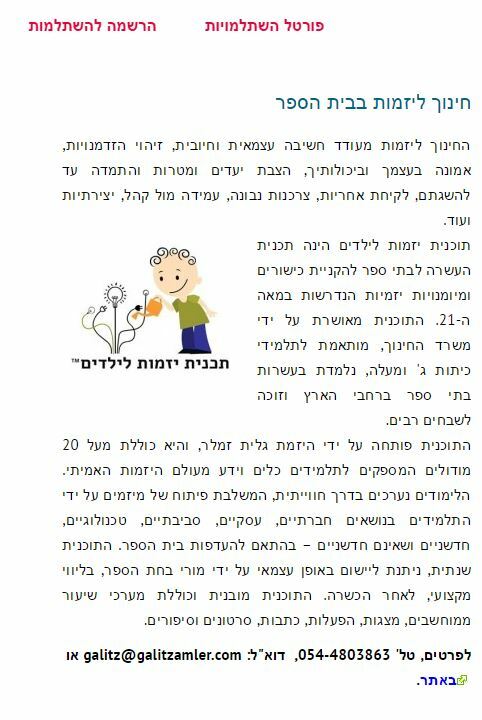 This is a selected section of the article: "The entrepreneurship course, according to Galit Zamler, the developer of entrepreneurial programmes for schools, helped the children to explore the subject in depth. During the first meetings, they discussed questions such as why in general, they should engage in entrepreneurship, what is the advantage they gain by developing initiatives, and what is the contribution of entrepreneurship to their lives. They reviewed and examined existing projects. They characterized potential entrepreneurs, and expanded their perspective to the entrepreneur's immediate surroundings, examined responses of the closest people and defined what is a supportive environment." "In order to define who is an entrepreneur, the students learned about success stories of entrepreneurs...The students met with young entrepreneurs, some of whom were successful and some who had failed. They wanted to learn from their experience. Later they learned about the importance of vision, formulated the principles of successful entrepreneurship, spoke about the required investment, and were not deterred from the less pleasant aspects like common mistakes of entrepreneurs, as well as review and analysis of failed ventures. All this followed the discussion of why you should learn from the experience of others. 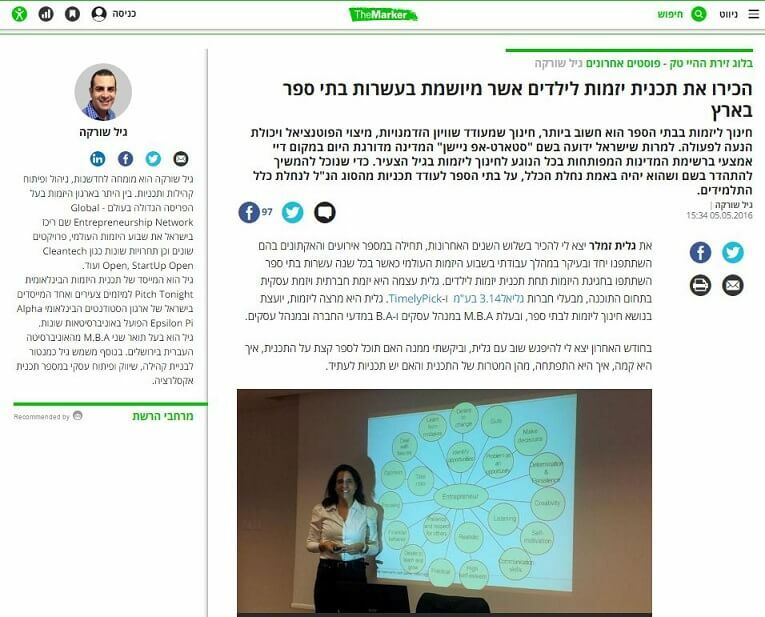 Guest entrepreneurs were also invited to the course..."
Read the full article - by clicking on the link (in Hebrew). In honor of 2014 GEW, a number of entrepreneurs were asked to write about their work. 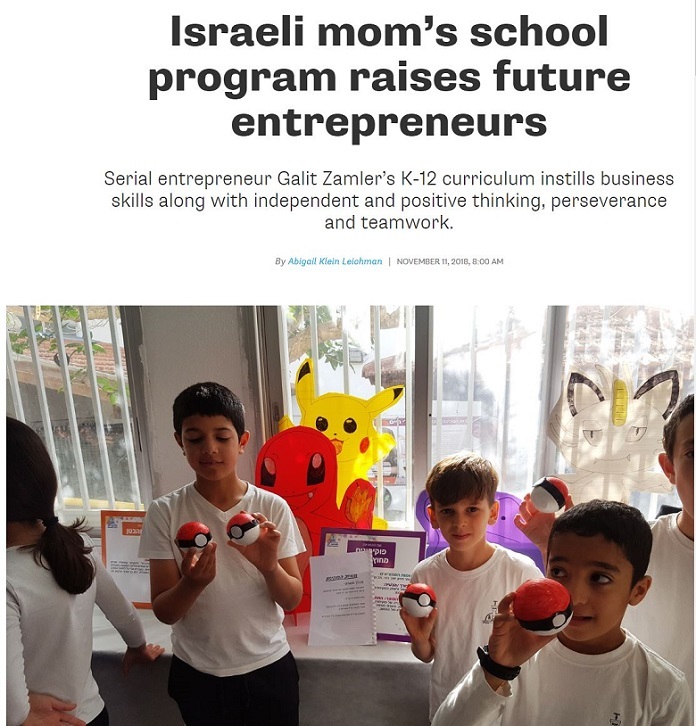 Galit Zamler responded to the call, and the column she wrote appeared in an article published in the global news under the title "GEW in Israel: entrepreneurs for the sake of encouraging the periphery." 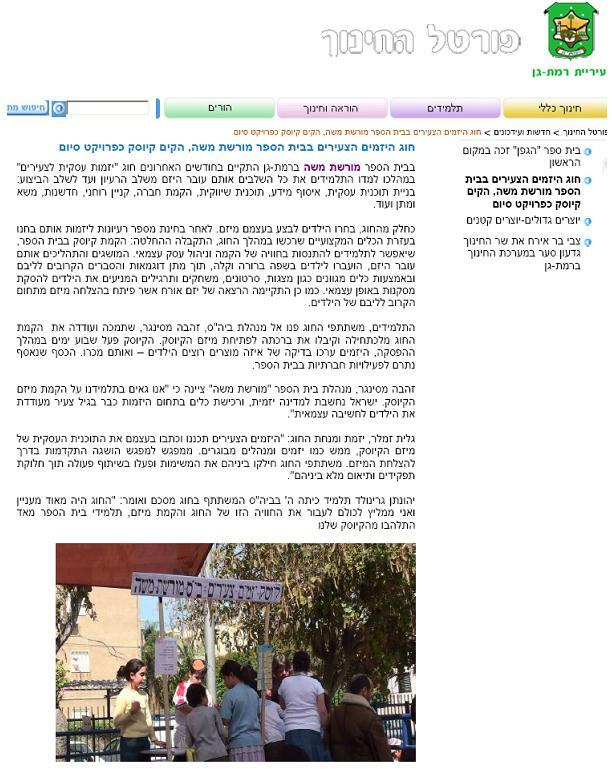 The subject of the column: "Israeli students mark the global entrepreneurship week/Galit Zamler." The Great People Everywhere organization was established in order to contribute and strengthen Israeli society, by providing recognition, appreciation and exposure to people who have decided to change their existing reality through a contribution to the community and the environment. The organization aims to promote the values of social justice and helping others which are expressed in "little" deeds daily and influence over both actions. The organization believes that communication and media tools do not provide a sufficient platform for social actions, and therefore "great people everywhere" sought to balance the situation and allow exposure to the public. The organization works to expose the good people behind the deeds and honor them, which they believe will bring awareness and motivate the public to give to others. Ladies and gentlemen! 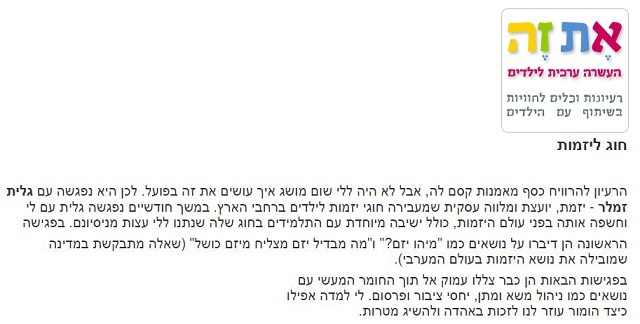 We are proud to present to you the latest righteous person of the month of May: Galit Zamler. Galit was chosen as the great person of the week. Galit has been leading the successful Entrepreneurship for Kids Program for several years. Recently, the Israeli foreign ministry hosted a delegation of leading educators from developing countries, to learn from us how Israel encourages entrepreneurship education from an early age. The firm chose Galit to lead the program. 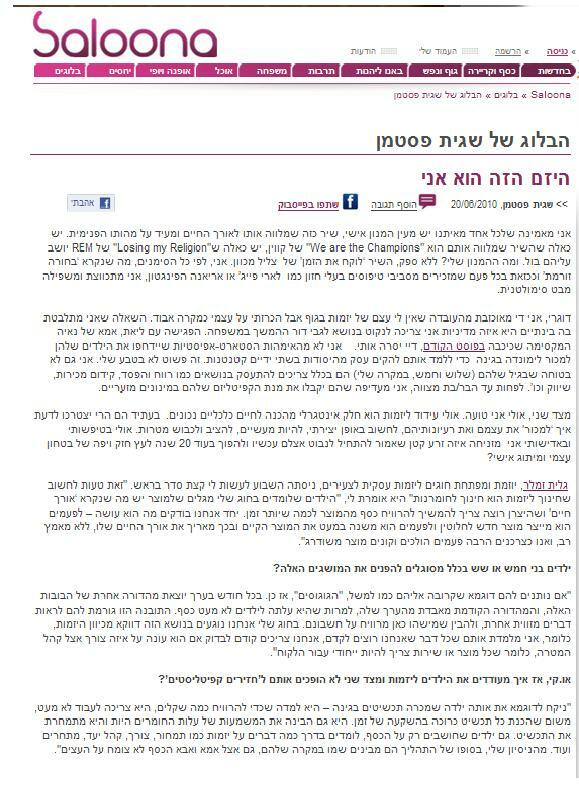 Galit does not manage the association and was not paid for her fantastic work, and many schools are now implementing her program. 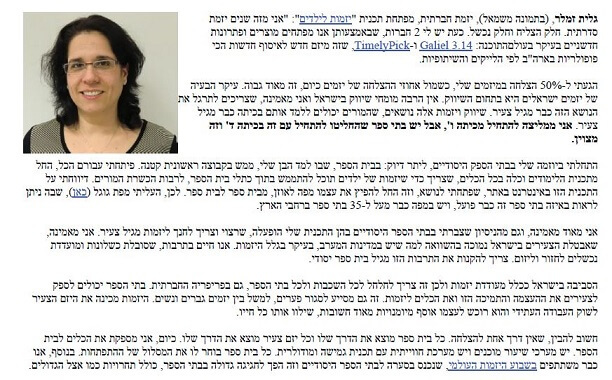 Galit, we have considerable respect for your contribution to the community and your efforts to promote young in the world, and in Israel in particular. Congratulations! Give her encouragement for her wonderful work and enter the page to give her a Like and recognize and appreciate more lovely people like her! 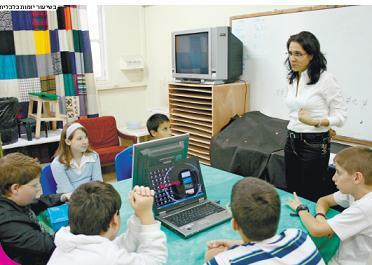 In the "Amirim" school in Binyamina, a group of grades 4-6 studied the entrepreneurial programme under the supervision of Hila Attias Almagor. The local newspaper "Vine" wrote about the course. 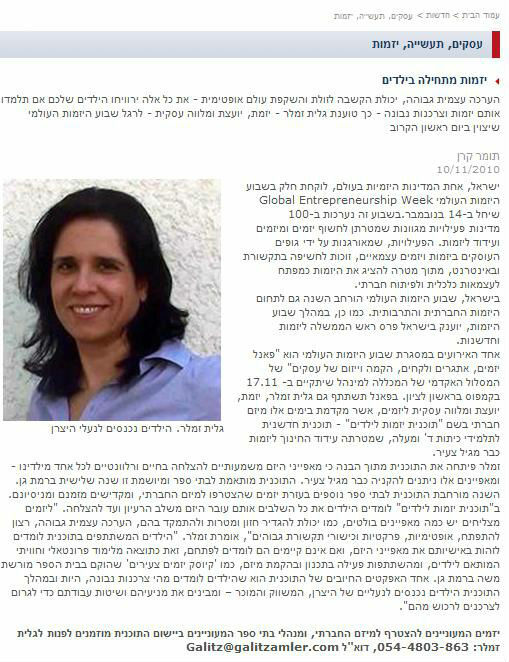 Magazine "Head of education" facing educators in Israel, dealt with in December 2012 on the subject of "entrepreneurship in education" and covered the activities of the children's entrepreneurial program. Li Keren, a nine-year-old girl, disengaged from the television for 100 days, during which time she also discovered the entrepreneurial activity. 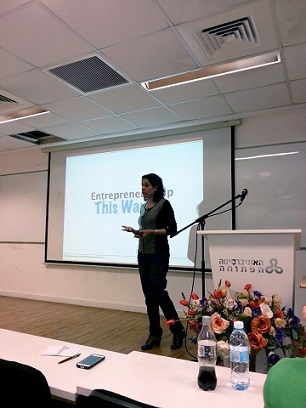 Towards the 2010 GEW, Galit Zamler takes part in a panel of entrepreneurs organized by the college of management. The financial portal "economist" wrote that "entrepreneurship begins with children". 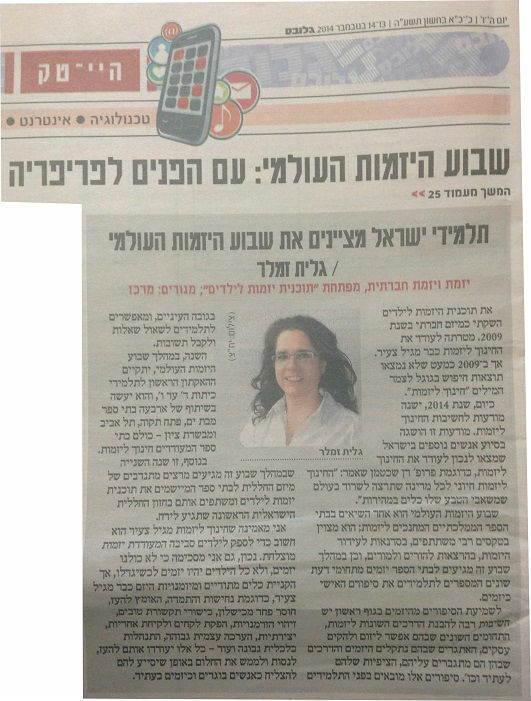 As part of Global Entrepreneurship Week, Anat Lev Adler wrote in Yediot Aharonot about the program. 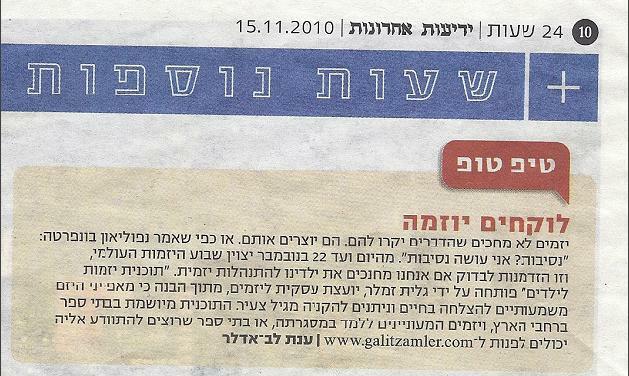 Interview with Galit Zamler to the blog of Sagit Fstman in the website Saloona on the subject "the entrepreneur is me". The program was implemented for two consecutive years, was very successful in the religious state school "Moreshet Moshe" in Ramat Gan. The program won praise from children, parents, teachers and the principal. 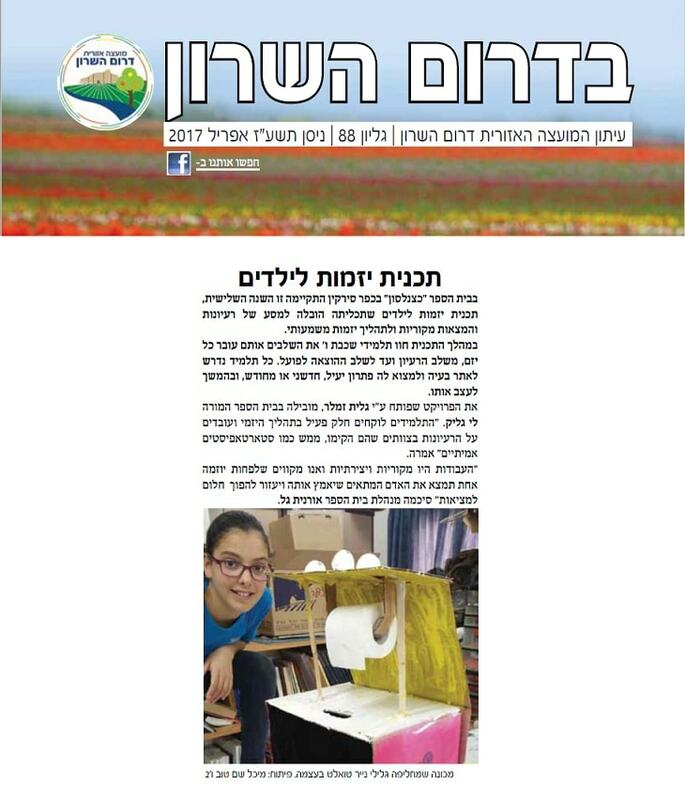 The young entrepreneurs were recognized and their final project was published on the site of the Ramat Gan municipality.